Aaaawwww, only 26th! You were one of my 10s, I really like this shot, especially together with your clever text for this challenge. Perfect title and capture. That face is so perfectly sharp. I even like the cage (??) in the background giving a pattern. Not voting. Haha excellent promotional idea, meets the challenge perfectly. Nice shot as well. Good job! Nice sharp focus on the lion and bokeh in the background almost making the fence disappear. I'm wondering if blurring the remaining crosshatch would be better. Good composition allows for excellent placement of the text. Nice lighting and I'm guessing a nicer edit - especially on that background fence. Nicely captured and good promotional poster. Great shot of the kitty - very good detail - and good forethought to frame it to support the text. 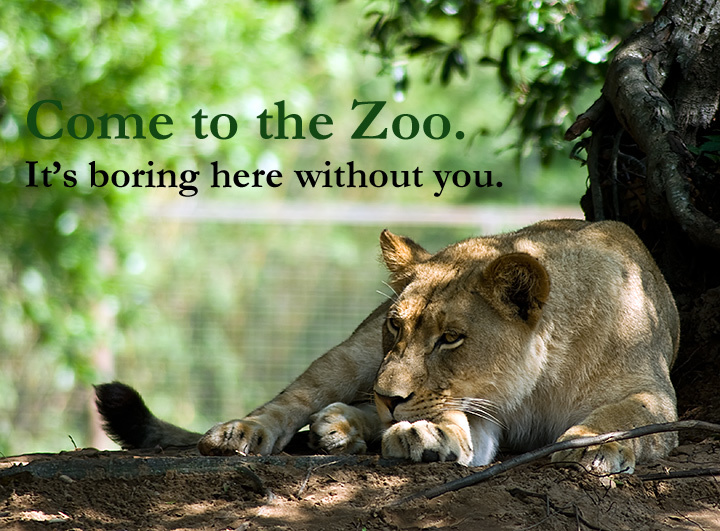 Love the "it's boring here without you" - very much fits the photograph and a good sentiment to promote the zoo! LOVE IT! That's perfect! You've taken an image that would hold less attraction and turned it into the perfect ad! Well done, a well deserved 10 for you. Nice sharp, simple image. I love it! Proudly hosted by Sargasso Networks. Current Server Time: 04/19/2019 07:10:05 AM EDT.